Two news stories emerged out of Amazon’s ebook business this month that are causing heart palpitations in old school publishers. The first is the revelation that Amazon is now selling more ebooks than print books. The second is the company’s hire of former Time Warner CEO Larry Kirshbaum to found new imprints (or publishing brands) to establish Amazon in literary and commercial fiction, business, and non-fiction. With Amazon’s digital dominance and push into frontlist publishing, how can content providers maintain their foothold in book publishing? One idea: continue to sell though third party distributors like Amazon, but strive to build direct consumer relationships, according to Elastic Path’s latest research Brave New Publishing World: Assessing the Impact of Ebooks on Consumers. With 70 million unique visitors per month, Amazon is in a league of its own when it comes to ebook discovery and sales. We found that about half of ebook readers typically start their search for new reads on retailer websites. Amazon’s numerous options for customer interaction with a title, such as Look Inside!, reviews, recommendations, and rankings, make it an extremely effective ebook marketer. 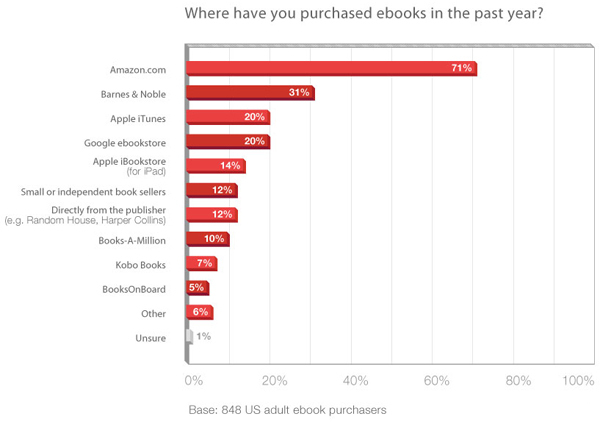 Looking at the chart below, almost three quarters of ebook readers bought from the ecommerce giant in the past year, no doubt in large part due to the Kindle’s popularity. At 31%, Barnes and Noble is a distant second. Apple iTunes is one of the fastest growing ebook distributors, along with the Google eBookstore and the Apple iBookstore, which both launched last year. Adopt flexible processes to create once, distribute everywhere. With the device landscape in constant flux, and a lack of format and metadata standards, publishers must rethink the way they create and deliver content to gain agility. They must re-engineer their processes to allow content to be transformed into multiple formats simultaneously and divided into smaller saleable “chunks”. Adopting streamlined XML-based workflows can help publishers reduce dependence on bestsellers to take chances on lesser known authors, and turn backlists into ebooks to generate long tail sales. Leverage third parties to maximize distribution. Third party distributors like Amazon, Apple iTunes, and the Google eBookstore are critical distribution channels for trade publishers seeking large audiences of digital consumers. To grow revenues, publishers should make their ebooks available across the full range of online ebooks superstores to access customers with Apple, Android, BlackBerry, and other mobile devices. By distributing through multiple outlets, publishers may retain some control over pricing. Strive to get closer to consumers. For publishers, creating direct-to-consumer relationships is challenging, but can help improve their understanding of customer behavior, fueling future sales. Post-sale, content providers can draw customers through links and references embedded in their ebooks. Another way to build direct traffic is to provide unique content like exclusive author interviews or previews of upcoming books. Once visitors arrive, publishers can then use community and social sharing tools to foster engagement and spread the word. Monetizing these burgeoning relationships through discounted book bundles, or related online content and products, is worth considering too. Create new distribution models and innovative products. As we mentioned in last week’s post on ebook monetization models, publishers should look to the more evolved video, gaming, and music industries for inspiration in finding new ways to monetize and reduce their dependence on Amazon, Apple and Google. All-you-can-eat subscriptions or club models where the consumer receives a free ereader and pays a monthly fee to access books for a fixed term, and individual book subscriptions with regularly updated content, show potential. Offer more value to authors. 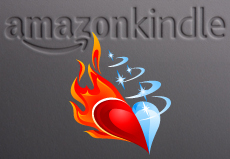 Last but certainly not least, with Amazon’s established Kindle Direct self-publishing platform and decision to launch their own imprints (including recently announced mystery imprint Thomas & Mercer), publishers can’t afford to take their existing relationships with authors for granted. They should continue to work closely as writers’ partners in editing, marketing, selling, and promoting books. And put more effort into exploring innovative ideas to expand authors’ fan bases and franchises while providing personal touches and a level of attention to detail that Amazon might find difficult to imitate. In the long run, however, offering higher royalties to come closer to Amazon’s Kindle royalty program that lets authors keep as much as 70% of the retail price might be the only way to retain top talent. Interested in more publishing content? Watch our on-demand webinar, Winning With Subscribers: Top Trends and Best Practices for Selling and Managing Subscriptions Online, where we analyze the risks and rewards of pursuing the subscription model. Alternatively, download a free copy of our research report, The Future of Magazines and Newspapers in the Digital Era.